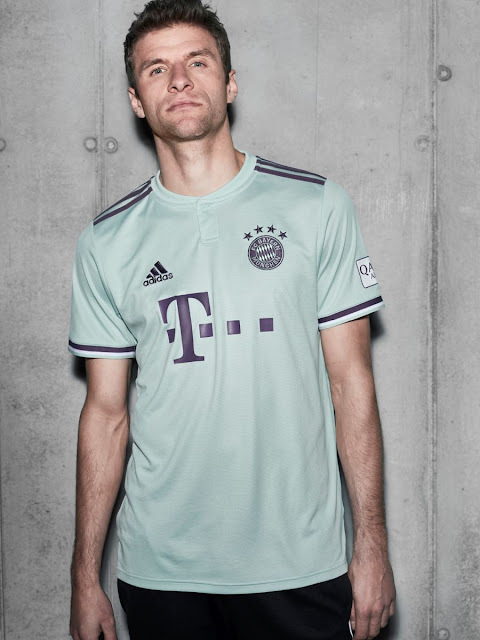 adidas Football today revealed the new FC Bayern away shirt that the German club will wear during the 2018/19 season. The current champions will seek to win their seventh straight Bundesliga title in a kit designed to stand out from stadium to street. The new all ash green shirt with purple trim brings a modern, streetwear style to the iconic club. Combining wearability with style, the kit features a newly improved performance silhouette. An elegant button collar and engineered sleeve cuff creates a sophisticated look suited to the pitch and the streets. For further information please visit adidas.com/football or go to facebook.com/adidasfootball or follow @adidasfootball on twitter to join the conversation or visit all FC Bayern social media channels at twitter.com/fcbayern, snapchat.com/add/fcbayernsnaps, youtube.com/fcbayern and instagram.com/fcbayern. For further information please follow @adidasfootball/ #adidasMY on Instagram or twitter to join the conversation.